treatment. MediSpa choices include the popular HydraFacial MD, a value of $175. Restrictions may apply; for details about the BOGO special, call (855) 374-3139. For many, springtime represents a new beginning. Through April 2017, MilfordMD is celebrating springtime with its BOGO Special: Buy a filler treatment of 2ccs or more and get a free MediSpa treatment. Dr. Buckley says he uses the spectrum of available fillers, including Juvéderm, Restylane, Radiesse, and Belotero. The one he uses depends on an individual patient’s needs. Some fillers are best used in the lips, while others are better for filling-in facial lines. Belotero and Restylane Silk, for example, are excellent choices to touch up the smile lines at the corners of the lips, he says. New statistics reveal soft tissue fillers are more popular than ever. The American Society of Plastic Surgeons (ASPS) unveiled its 2016 statistics in March 2017, which show that among the 15.5 million minimally-invasive cosmetic procedures member plastic surgeons performed in 2016, soft tissue fillers came in at number two among the top five most popular choices. Following botulinum toxin type A, which includes Botox, surgeons reported doing 2.6 million soft tissue filler procedures. That’s up 2 percent since 2015. “We were among the first practices in the U.S. to offer Galderma’s facial fillers Restylane Refyne and Restylane Defyne for treatment of laugh lines, or nasolabial folds. They are among the latest dermal fillers to get FDA approval,” Dr. Buckley says. Other patient favorites, according to the newly released ASPS statistics, include chemical peels, which came in at number three among minimally-invasive cosmetic procedures, and microdermabrasion, which rounded out the top five. 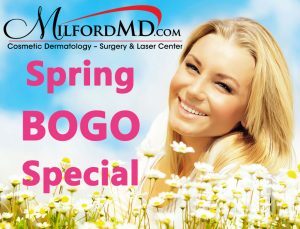 The April BOGO Special at MilfordMD includes complimentary MediSpa peel, microdermabrasion, and HydraFacial MD options, when patients purchase fillers. Peel types available as part of the special include the Parisian Peel, Salicylic Peel or Glycolic Peel. “When applied to the skin by a trained practitioner, chemical peels remove the skin’s damaged outer layers and stimulate the production of new collagen. The result is better skin appearance, a more even skin tone and a softening of acne scarring, sun and age spots, fine lines and wrinkles and more,” Dr. Buckley says. Topping off the free MediSpa options in the April BOGO Special: the HydraFacial MD. Marie Claire magazine named HydraFacial MD one of five “it” beauty industry innovations for 2015, and Allure magazine called it “One fantastic facial.” The HydraFacial is customized approach for rejuvenating the skin. The treatment deep-cleans facial skin, extracts impurities and brings smooth, soft, evenly toned skin back to life. Licensed aesthetician Andrea, who is on staff at MilfordMD Cosmetic Dermatology Surgery & Laser Center, provides the practice’s MediSpa services, ranging from the HydraFacial MD and peels to microdermabrasion, body waxing and makeup. For more on MilfordMD’s April specials, go to MilfordMD.com.